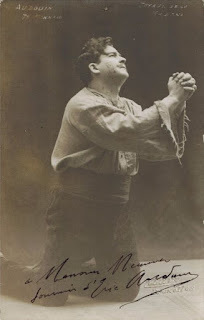 He received his education at the Conservatoire National de Paris and made his debut in 1906 at the Paris Opéra-Comique as José in ‘’Carmen’’ (See photo). During the following two years he appeared at this opera house and then made guest appearances at the famous opera theaters of the French province. In the 1911-1914 seasons he joined to the Théâtre de la Monnaie in Brussels, where he also sang after his participation as a soldier in the First World War, in the 1918-1921 seasons. Then he returned to France and from 1923 to 1927 seasons appeared at the Grand Opéra in Paris. His repertoire included Werther, Jean in ‘’Le Jongleur de Notre-Dame’’ by J. Massenet, Demetrius in ‘’Aphrodite’’ of Erlanger, Faust in ‘’La damnation de Faust’’ by H. Berlioz, Samson in ‘’Samson et Dalila’’ of C. Saint-Saëns, Jean in J. Massenet’s ‘’Hérodiade’’, Julien in ‘’Louise’’ of G. Charpentier, Monostatos in ‘’Zauberflöte’’ (Théâtre Gaîté-Lyrique Paris, 1912), Lohengrin (Marseille, 1925), Siegmund in 'Walküre, Tannhäuser, Walther von Stolzing in ‘’Meistersingern’’, Duke in ‘’Rigoletto’’, Radames in ‘’Aida’’, Turiddu in ‘’Cavalleria Rusticana’’ and Gennaro in ‘’I gioielli della Madonna’’ by E.Wolf-Ferrari. After his retirement he taught singing in Paris. It's a little strange for me, that such a fine tenor never made recordings.